Photograph courtesy Mark Cook. 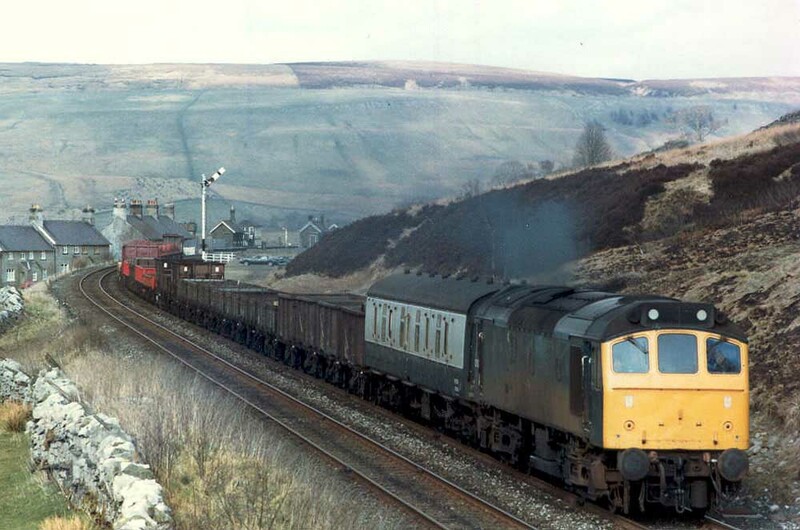 25152 hauling a very varied mixed freight at Garsdale on April 15th 1982. 25152 had another eighteen months to enjoy this fine Pennine scenery. The nineteen and a half year career for D7502/25152 was split between the London Midland (15.5 years) and the Western Region (4 years). Time between last Classified repair and withdrawal: 67 months. February 1967 to London Midland Division (D01). 25152 was the 212th Class 25 to be withdrawn, one of five withdrawn during January 1984. After withdrawal 25152 was stored briefly at Crewe prior to movement to Swindon Works with 25120 (from Springs Branch) & 25152/167/168 (from Crewe) during February 9th - 15th 1984. 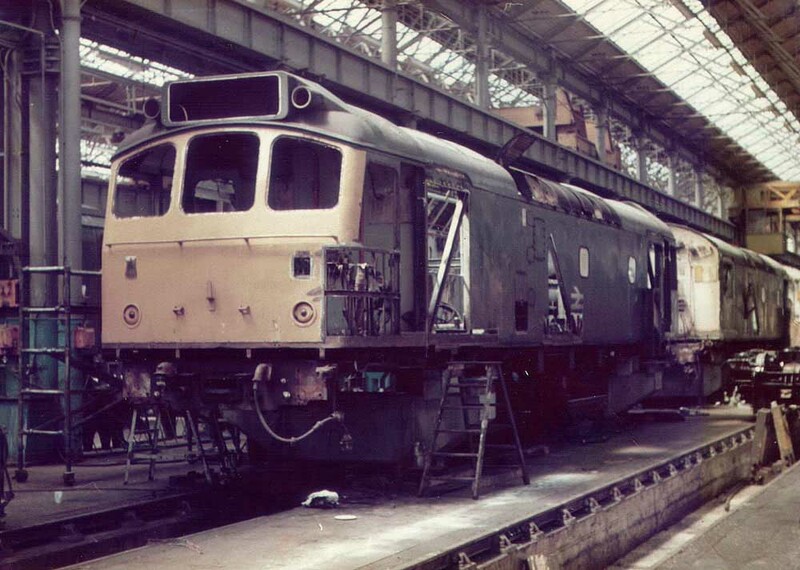 25152 was scrapped by the end of January 1985. Noted Derby Works June 1978 (Classified repair). On July 23rd the summer dated roundtrip Nottingham - Llandudno Town was worked by 7502 & 7521. Condition April: two-tone green livery with small yellow warning panels, no blanking plates, hand/footholds present, straight sided sandboxes, three-rung bogie mounted footsteps, engine exhaust in original location. On August 22nd 7502 & 5244 were noted at Derby on an unidentified passenger service. On May 6th 7502 & 7577 worked the 7B34 19.40 Bristol Temple Mills to Ponsandane freight, the 1E21 10.30 Penzance to Bradford passenger service to Plymouth, then light engines to Laira depot and ending with the 7B31 18.20 Plymouth Friary to Par freight. On May 20th 7502 & 7577 were noted at Long Rock shed whilst 7506 was at Penzance station. The 11.02 Barnstaple Junction - Exeter Riverside vans was worked by 7502 on June 10th. 7502 was stabled at Exeter on July 2nd. 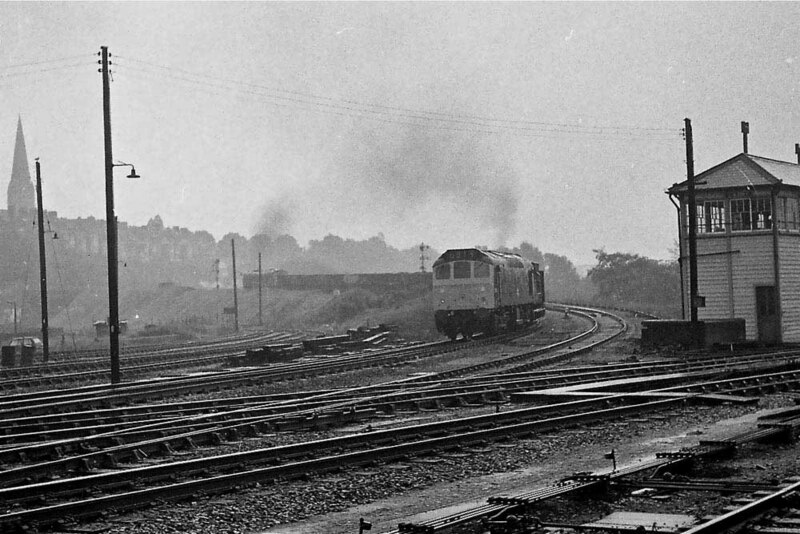 On August 19th 7502 worked the 20.55 Exeter St David - Newton Abbot. Photograph courtesy Peter Lovell. On a wet & dismal October 31st 1972 7502 banks Class 45 No.120 and its train towards Exeter Central. On July 31st 7502 hauled preserved Hymek Class 35 No.7017 from ?? to Taunton as the 9X42 special movement. On July 21st the 11.40 Shrewsbury - Aberystwyth with four coaches was worked by 25152. A Brighton - Aberystwyth day excursion was worked roundtrip Wolverhampton - Aberystwyth by 25152 & 25269 on September 12th. On September 18th 25152 & 25129 were noted at Birmingham New Street with an unidentified passenger working. On March 27th 25152 was noted with a permanent way train between Milford and Brocton (Trent Valley line) whilst the next day (28th) it was noted at Stoke with a sand working from Oakamoor. The afternoon Whitemoor - King's Lynn freight was worked by 25152 on November 11th. On April 29th 25127 & 25152 worked a Mountsorrel - Trowse stone train. They were noted the next day stabled at Norwich. 25152 returned west on the 30th's evening parcels to Nottingham. Photograph courtesy Graham Turner. 25152 undergoes extensive repairs at Derby Works on June 11th 1978. The sheeting over of the boiler room openings were undertaken during this repair. The 08.52 Leicester - Skegness and the return 12.32 Skegness - Leicester were worked by 25152 & 25321 on July 29th. The 08.45 Leicester - Skegness and the return 18.30 Skegness - Leicester (a day excursion?) were worked by 25152 & 25113 on April 16th. The late morning Banbury pick-up freight was noted at Oxford on September 26th with 25152. There was a multitude of Class 25s in the area of Bushey & Oxhey station from February 17th onwards following the dramatic derailment there of the 16th’s 20.25 Euston – Manchester due to a track defect. The locomotive 87007 was the only part of the train to remain on the tracks, four of the MkIII coaches ended up on their sides, with one (M12162) bringing down the overhead gantries, which blocked the slow lines. Most fortunately there were only minor injuries. Three breakdown cranes attended, from Bescot, Finsbury Park – brought in by 25279 & 25256, and Old Oak Common – arrived behind 25152 & 25189. The slow lines were reopened late on the 17th, the dc lines late on the 19th, the fast lines by the 25th. On June 15th 25152 was westbound at Exeter St Davids with an unidentified passenger working. A Rugby - Barmouth charter on June 22nd was worked roundtrip Wolverhampton - Machynlleth by 25152 & 25123, a diesel multiple unit took the passengers between Machynlleth & Barmouth. On August 25th 25152 worked the 11.30 Bangor - Manchester Victoria. On September 6th the 08.42 Sheffield - Huddersfield and the 16.58 Huddersfield - Sheffield (being out and back portions of a York - LLandudno Town diagram) were worked by 25152. On September 15th 25152 was noted southbound (?) through Trent with a lengthy train of mineral wagons. 25152 & 25302 were noted on the Up main at Barrow upon Soar on November 26th with a lengthy coal train. 25150 & 25152 were noted passing Wakefield Kirkgate on February 4th with a lengthy tripper freight for Healey Mills. 25152 was noted northbound through Peterborough with an engineers train on April 22nd. 25152 was noted passing Leicester light engine (with two other Class 25s) on May 7th. 25152 was stabled at Northwich depot on July 12th. On August 12th a Kettering - Blackpool North day excursion was worked roundtrip by 25152 & 25146. The 07.40 Euston - Aberystwyth from Wolverhampton and the return 16.05 Aberystwyth - Wolverhampton were worked by 25152 & 25090 on August 29th. On November 13th 25152 was noted on the Leeds - Morecambe run due to a diesel multiple unit failure. A late afternoon Manchester Victoria - Newcastle relief was worked by 25152 & 25051 on January 10th. 25152 was noted with loaded Cartics at Ellesmere Port on August 18th. On September 7th 25152 was noted passing Winchester with a southbound freight (Toton - Eastleigh? ), it was later noted heading north light engine. On December 21st 25152 & 25140 were used on a recovery train for telegraph poles and wire on the Blaenau Ffestiniog branch. The train included a Mk.1 brake coach for the Signalling & Telegraph staff borrowed for the weekend from a Llandudno - Manchester set. Flooding at Llanrwst delayed the returning train and the return of the coach to normal service. 25287 & 25152 doubleheaded a Northwich - Tunstead ICI working through on a snowy January 22nd. 25152 was noted northbound through Chesterfield with a mixed freight on March 7th. A ballast train from Whitemoor to Bury St Edmunds on April 27th was worked by 25152 & 31182. The train spent most of the day at the reballasting location, then headed off to Stowmarket to run-round and return to Whitemoor. 25152 was working a loaded Tunstead - Northwich ICI PHV hopper train on May 3rd. On July 1st a Skipton - Leeds service was worked by 25152 following the failure of a diesel multiuple unit. 25152 was stabled at Bristol Bath Road on September 19th. 25152 and three other Class 25s headed south through Crewe station on October 22nd. 25152 was noted passing through Longport with a down goods, about seven empty low sided wagons and two brake vans on January 3rd. 25152 was withdrawn on January 26th 1984. Page added March 12th 2013.